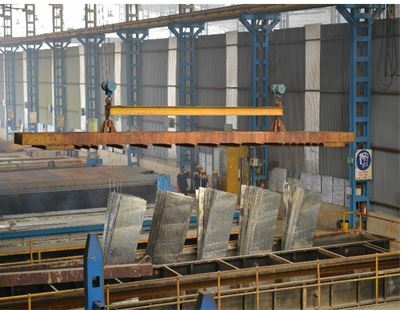 Hot-dip galvanizing is the process of coating iron or steel with a zinc layer by passing the steel through a molten bath of zinc at a temperature of around 860⁰F (460⁰C). When exposed to the atmosphere, pure zinc reacts with oxygen to form zinc oxide, which further reacts with carbon dioxide to form zinc carbonate, a dull grey, fairly strong material that resists corrosion in many circumstances, protecting the steel from the corrosive elements. Galvanized steel is widely used in applications where rust resistance is needed, and can be identified by the crystallization pattern on the surface. Indiana has its own state-of-the-art hot dip galvanizing facility which has been imported from Europe. The dimension of zinc bath is 8 meters long x 1.2 meters wide x 2.5 meters deep. The proven capacity of the plant is 30,000 MT per year. The galvanizing furnace is equipped with pulse fire burners which are controlled by a PLC system. Indiana follows the seven tank process and follows all the guidelines of the Pollution Control Board. The galvanizing facility is equipped with zinc and acid fumes extraction systems, Effluent Treatment Plant for waste acid and rinsing water which helps in controlling pollution.